In recent days, we’ve heard some people make comments that imply the entire Caribbean is destroyed as a result of the hurricane damage. We even saw a local wedding venue trying to capitalize on the situation by offering deals to couples who’s destination wedding plans were surely canceled as a result of the the recent hurricanes. And just this morning, we saw someone comment online that Mexico was destroyed as well. Sadly, the people making these comments and assumptions have likely never looked at a map. If they had, they would realize that Mexico was not even hit by a Hurricane at all (and the earthquakes that have hit, have been thousands of miles from the most popular tourists spots). They would also realize that the vast majority of the most popular locations in the Caribbean saw little or no damage from the storms. Of course it is true that there are a number of locations in the Caribbean that got hit hard and are in dire need of help in recovery. However, the amount of mis-information out there is quite concerning. The truth is that these countries rely on tourism as a major part of their economy. They rebuild quickly, and the people hope that instead of shying away from the area because a hurricane went thru recently, you will instead choose to still come to paradise and enjoy yourself. Times like this after all, is when these countries need tourism the most. In light of the bad information we keep hearing from people, we thought we would share with you the most recent hurricane damage update on the status of things. 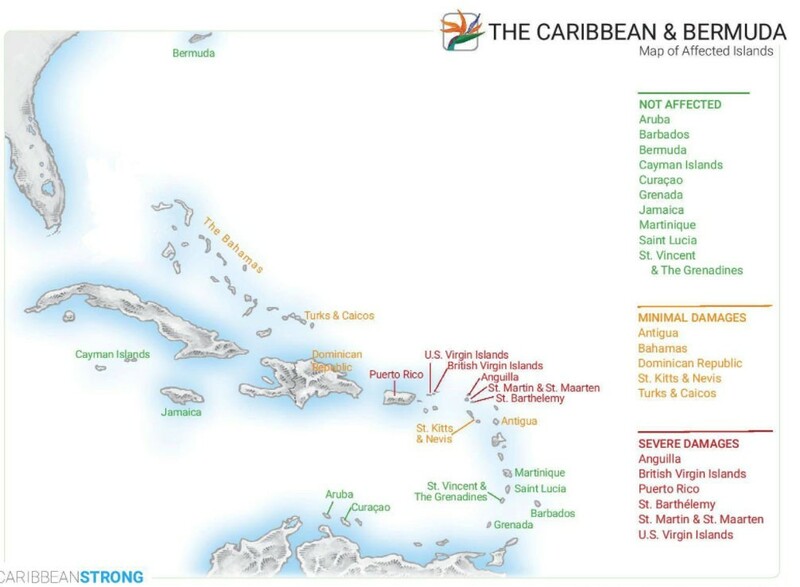 Not Impacted: Aruba, Bonaire, Bermuda, Barbados, Curacao, Grand Cayman, Grenada, St. Lucia, St. Kitts and Nevis were not impacted by either Hurricane. All hotels are open for business and all off-site venues are operating normally. This entry was posted in Caribbean & Mexico Travel and tagged Caribbean, Caribbean Islands, Hurricane Harvey, Hurricane Irma, Hurricane Maria. Bookmark the permalink.